You can use a microwave to heat an onion before chopping to avoid the tears. Chopped raw onions produce tears because the knife causes cell damage in the onion, releasing sulphuric gas. That sulphuric gas emitted from the onion reacts with tear ducts, irritating the eye and causing crying. Heating the onion prior to chopping it denatures, or breaks apart, some of the enzymes that cause the release of the sulphuric gas, helping keep the tears at bay. Knowing how to heat an onion so you don't cry may help make the antioxidant-rich vegetable a staple in your kitchen and cooking. Wash the onion and place it on a microwave safe dish. Pierce the onion all over its surface with a fork immediately before placing it in the microwave. Piercing the onion will release some of the gas so minimize contact with that by putting it in the microwave immediately and closing the door. Heat the onion on medium (50 percent) heat for 30 seconds. The enzymes in the onion start to denature at 158 degrees Fahrenheit -- check the temperature using a kitchen thermometer. Continue to cook at medium power in 30-second increments until the onion's internal temperature reaches 158 F.
Cool the onion to room temperature before peeling and cutting. Use a sharp knife and remove the root end last to avoid releasing any residual gasses. 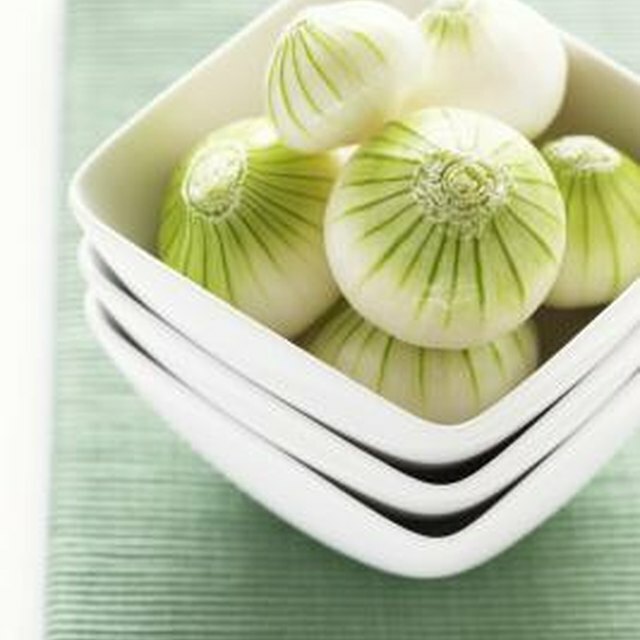 Because the onion will be partially cooked after this heating process, reduce the amount of time to cook it in the recipe, adding it at the end if possible, to avoid overcooking. 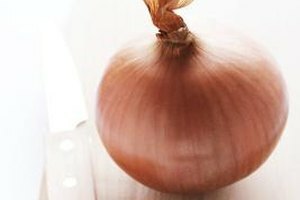 In the absence of a microwave, simmer the onion without piercing it in a pan of water on the stovetop until it reaches 158 F.
When pre-cooking the onion doesn't work for your recipe, try chopping it under running water to whisk away some of the sulfuric compounds before they reach the air. Wear gloves or wash hands thoroughly after handling onions to avoid transferring the irritating oils to your eyes.